Audition for JUNK REDEMPTION this Friday and Saturday! Audition for a part and, thus, take part in the highly collaborative process of its creative birth. Be prepared to experiment, introspect and express your most innovative artistic inclinations. HOW: No preparation necessary, just bring your brain. 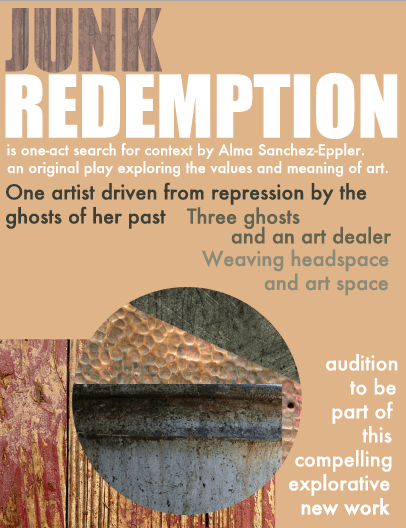 Posted by BZOD in Auditions, Culture, Events and tagged Alma Sanchez-Eppler, art, Junk Redemption, original theater on February 2, 2012 at 8:00 AM.